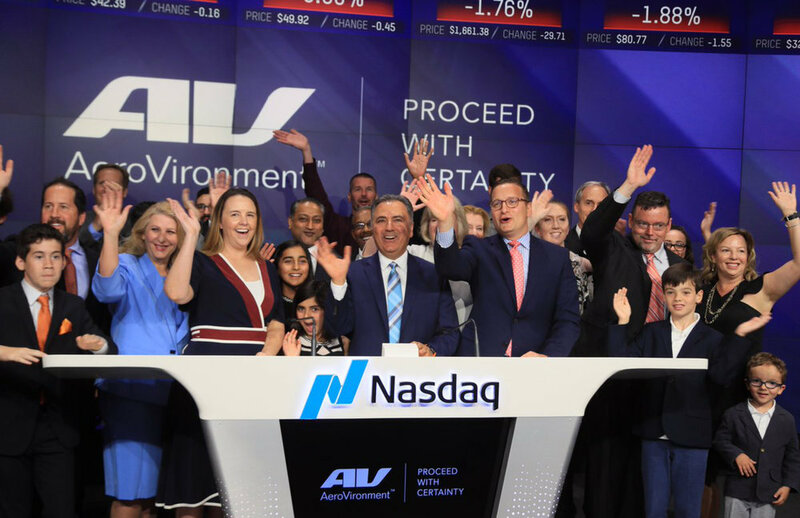 AeroVironment is an American technology company founded in 1971 by Dr. Paul B. MacCready, Jr.
For nearly half a century AeroVironment has been leading the way with their trailbrazing and diverse innovations redefining how the world drives and flies. 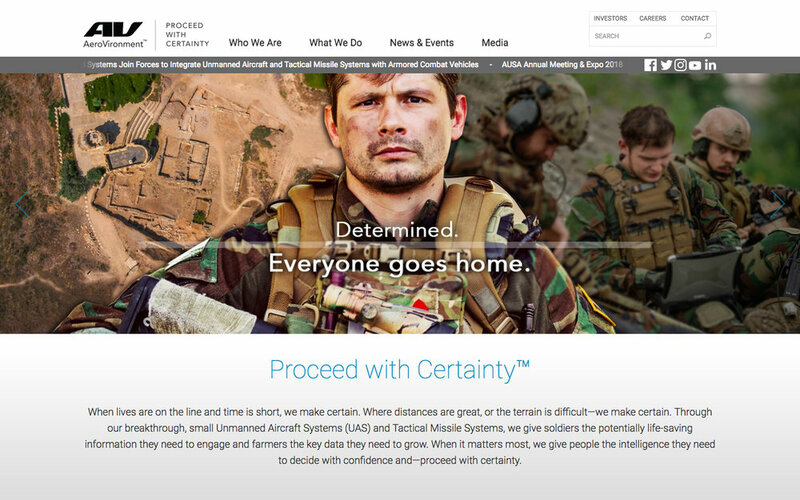 From developing the first human-powered aircraft, first practical electric car, flying the Nano Hummingbird drone, record-setting, solar-powered aircraft flights in near space, and reshaping the battlefield with portable, hand-held, tactical drones and loitering munitions, AeroVironment has cemented their reputation around the world as unrivaled technological pioneers. 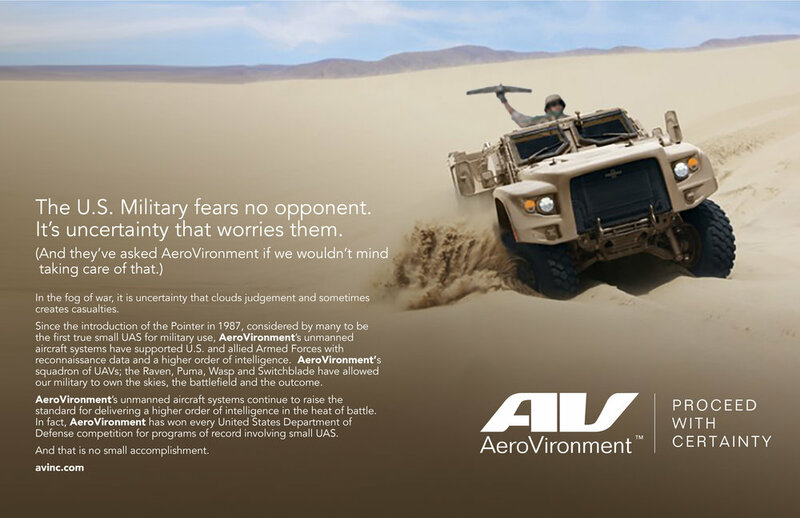 AeroVironment was known primarily as a company that produced Unmanned Aircraft Systems (drones) for use by military forces in Afghanistan, Iraq and elsewhere. It was expanding its business to address emerging commercial applications in industries such as agricultural and energy . The company even had a business providing electric vehicle charging stations. 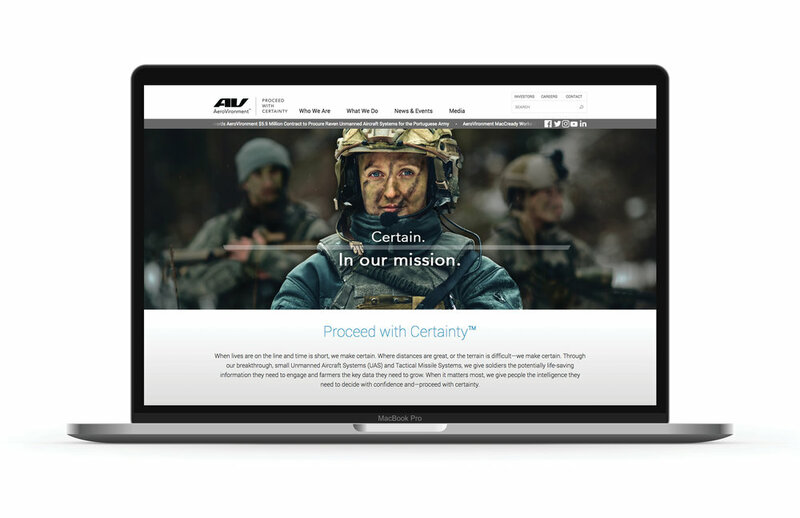 After extensive research we ascertained that what made their unmanned aircraft systems so invaluable in combat was directly relatable to their new business sectors. 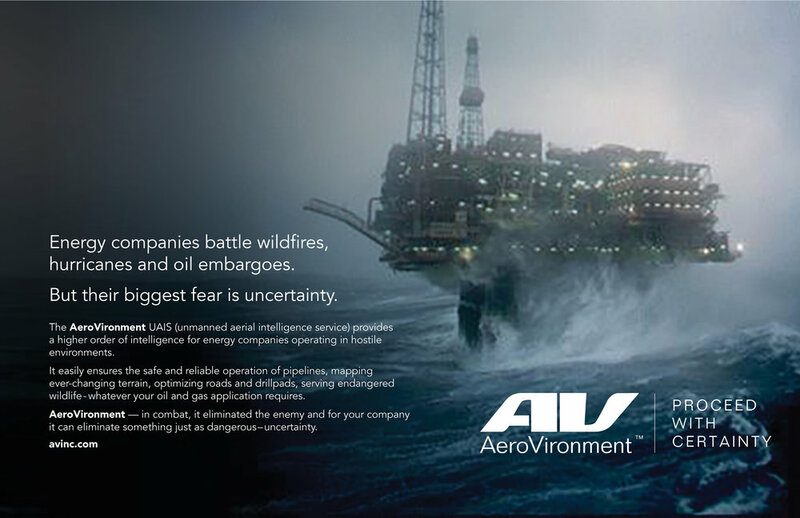 What AeroVironment products do is to provide instantaneous actionable intelligence. 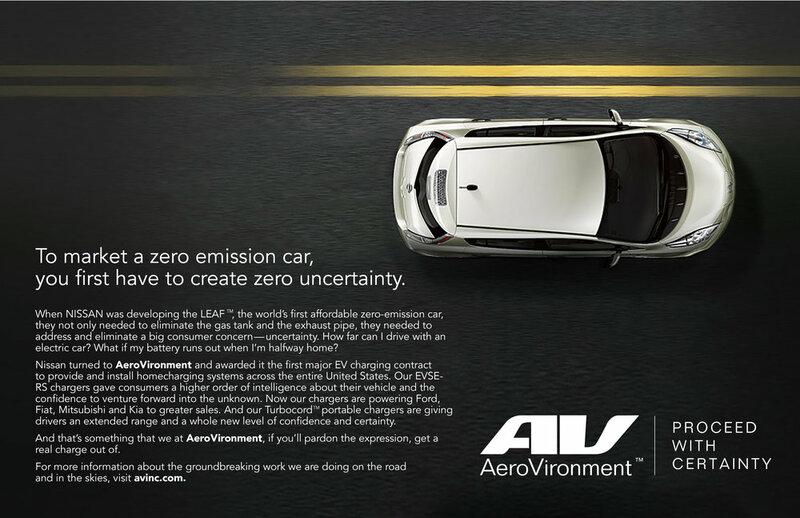 They removed uncertainty from what lay ahead in the field, whether that was a battlefield or a cornfield, and even removed uncertainty of whether you could complete a trip in your electric car. They provided a simple to use solution in an ever-complex world. 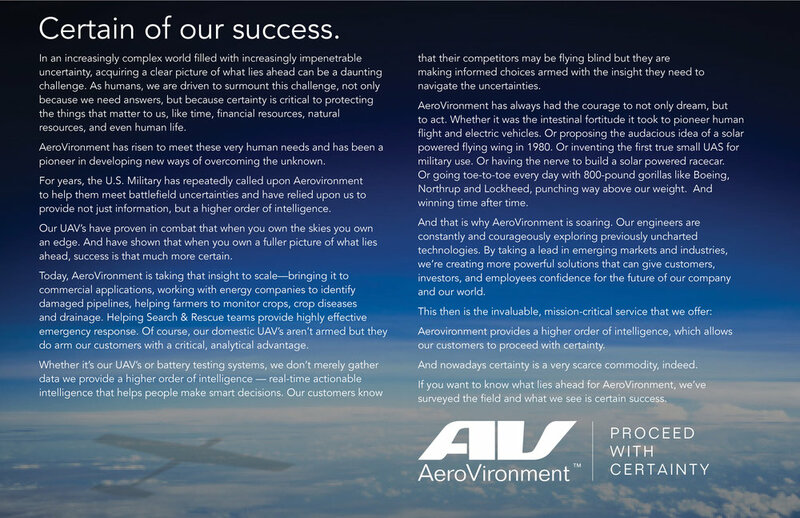 AeroVironment is a courageous technology company that provides customers with actionable intelligence, so they can proceed with certainty. The line was an internal rallying cry for its employees, a confident statement to its investors and a comforting thought to its customers. We created brand positioning, messaging and proposed ads. The tagline and positioning statement were incorporated into videos, website, intranet, company newsletter and even the flags flying outside their building. 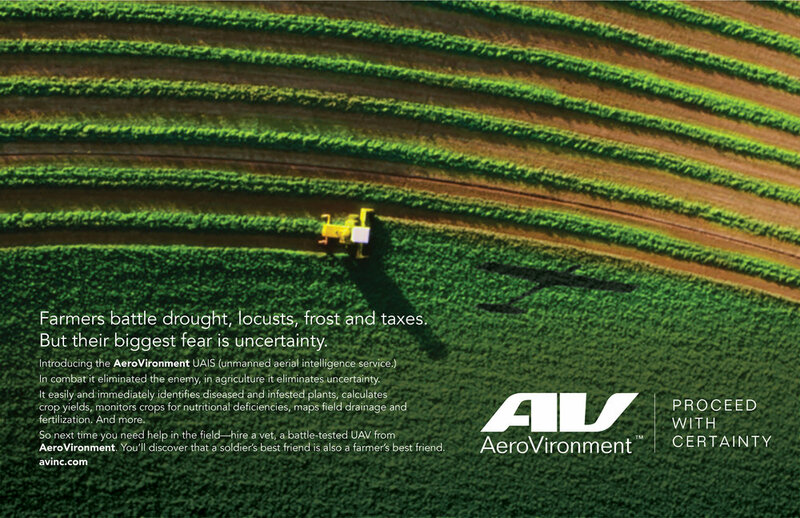 Without any ambiguity or uncertainty, AeroVironment’s new identity received immediate positive feedback from stockholders and customers. It became the organization’s promise to all of its constituents and helped lead to unprecedented growth for the company. AeroVironment now counts 45 allied nations as customers, with 46% of total company revenue coming from the international markets. Click on images to view our work. AeroVironment Unmanned Aircraft Systems and Tactical Missile Systems are relied upon by U.S. Armed Forces, the German Navy, the Royal Canadian Navy, as well as the Portuguese, Netherlands’ and Australian Defense Forces. They also helped NASA develop the Mars Helicopter. We’re proud that the work we did is giving wings to this innovative company. Now, we can proceed to helping other companies soar.